Influencer marketing can achieve the highest level of success when marketers have the greatest ability to reach relevant audiences and impact the customer journey. Traackr gives you the ability to discover the right influencers who lead the conversations you care about and influence your customers' opinions. There are multiple entry points to influencer discovery. 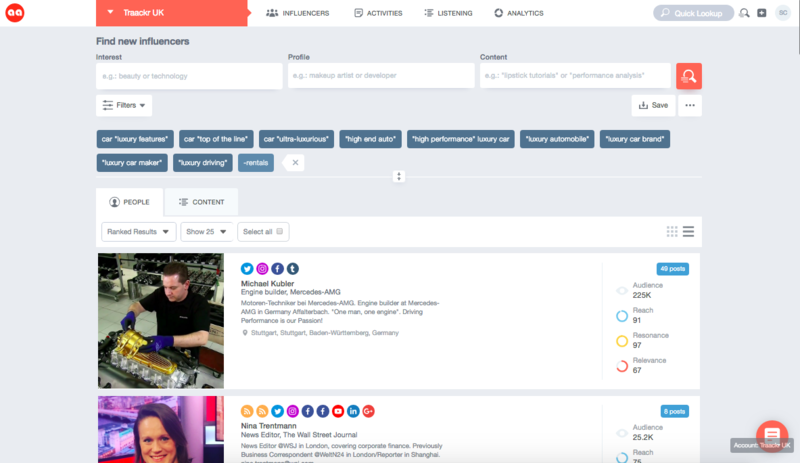 Traackr gives you the ability to search for a type of influencer, using socio-demographic criteria (such as profile information or job title) to hone in on a very specific influencer target. A classic example is a mom or a dad influencer, a CEO, a journalist, or people who have affinity to a brand. For example, you can enter also your brand as a profile criteria. Through Traackr’s search, you are able to search influencer content to find people who are leading any online conversation. When you define keywords, hashtags, or brands, Traackr scans the social web to see who is mentioning, how often they mention, and how recently they mention your keywords. The better the keywords and phrases you define, the more precise your results will be, therefore being specific is important. See our Tips for smart keyword-based discovery. Clicking on Filters, and then Influencer Attributes filters, there are many other criteria you can define to hone in on a very specific influencer target. You can target influencers by gender—female or male. If you’re looking to activate influencers in a new city to invite to your upcoming event, or to reach a new market, you can geo-target your search based on location—continents, regions, countries, US states and Canadian provinces. You can also target influencers by language. Please note that changing the language filter will not translate your keywords. Make sure you enter your keywords in the correct language. See our list of supported languages and countries. If the audience you want to engage is mostly active on a specific platform—Blogs, Twitter, Facebook, YouTube, Instagram, Twitch, or others—you can search for influencers just on that specific social platform. Once selected, you can then also target by audience size and engagement rate on that particular platform. You can filter your search to surface influencers with specific score ranges. This can be helpful if you're targeting tier 1 (celebrity) influencers, or if you want to focus on tier 2 (the magic middle) and tier 3 (micro) influencers. If you're searching for influencers on one particular platform, you can also use "Number of Followers" to set criteria for follower numbers just on that one platform. You can also filter your results to focus on new influencers or run a search across your existing influencers only. If you're looking for influencers who reach a specific type of audience, you have the ability to select multiple audience demographics and psychographics characteristics, including age, gender, family status, location, occupation, interests, and brand affinity. By incorporate audience insights into the discovery process you make sure your message reaches your core audience. Read more on Targeting the right audience. Influencers are discovered across the social web and ranked based on 3 macro metrics. Reach looks at how many potential eyeballs can view an influencer’s content—pulling stats from across social channels including blog visitors, Twitter followers, YouTube subscribers, etc. Resonance looks at how much an influencer’s audience cares about the content (s)he creates—including stats such as linkbacks, retweets, shares, mentions, comments etc. Relevance looks at how consistently an influencer talks about your keywords—surfacing influencers that are most relevant in the context of the conversation that you defined. Relevance is a factor of how often someone uses the keywords that drove the search; the timing of the keyword usage (more recent posts are weighted more heavily); the diversity of the keywords used by an influencer; and the placement of keywords (title vs. body). The next step is diving into the influencers’ profile to qualify them and select the ones that are the right fit for your program. Remember, influence means nothing without context. So rather than look for every single “influencer” out there, be strategic about who makes the cut and who doesn’t. Focus on building deep relationships with a finite group of solid influencers, who are not necessarily mega-celebrities, but whose opinion can influence their relevant audiences; that is much more valuable to you. Once you narrow down your pool of influencers, you can hand-select them or bulk-add them to your influencer network. If you have a specific initiative or project that you’re looking to kickoff, you can directly add them to that project. You can save your keyword terms in order to re-run a search in the future (or continue to refine your keywords), by clicking on the Save button. You can save up to 10 searches. To view your saved search history, click on View Saved Searches in the options drop down menu. You can re-run the search by clicking on the magnifying glass. You can share a search with other team members by generating a unique URL using the options drop down menu. This is a great way to collaborate with team members on the search terms.